Willy Russell’s ever-popular play Educating Rita has been revived so frequently over the years that one begins to wonder if late-learner Rita is in danger of becoming over-educated. But there are good reasons why Elizabeth Newman’s fresh account of the young working-class hairdresser’s journey of self-advancement through studying Eng Lit feels just as uplifting and enlightening as it did more than 30 years ago. First, it’s flawlessly acted by Jessica Baglow and David Birrell. Baglow’s Rita blows into the world of 1980s academia like a gust of Merseyside air. She really does look and sound as if she’s just come from the backstreets with her comic-book notions about higher education only being for “kids called Jones Major and Jones Minor.” By contrast, Birrell makes Frank, her bookish Open University tutor, a stale and emotionally locked-in alcoholic who secretes his booze among literary classics. Second, these well-rounded performances develop into a sparring teacher-pupil double act. And even more skilfully handled is the inevitable empowerment exchange between the aspiring learner and the apparently learned. Finally, it’s this tension between discovering a new identity but losing authenticity that provides Newman’s production with its most telling dramatic moment, when Rita starts spouting critical discourse that sounds just as phoney as Frank’s highbrow poetry. 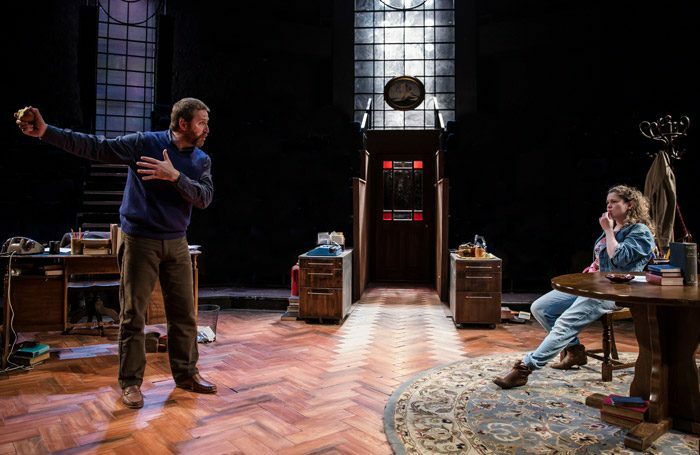 And Ciaran Bagnall’s set design, filled with brown furniture and bookcases dangling from the ceiling, provides a suitably enclosed space that both liberates and entraps them in a production that leaves you questioning if book learning really is the route to self-fulfilment.